You've heard it before. Remake an old 1980s television show no one seems to care about into a modern day, big budget movie with the stars of today. 21 Jump Street is the loosest of television to big screen adaptations and revels in it. The brainchild of actor Jonah Hill, who serves as producer and story writer, the film is a surprisingly hilarious buddy cop, action, teen comedy of pure fun and enjoyment. Directors Phil Lord and Christopher Miller (Cloudy with a Chance of Meatballs) establish a hard R-rated comedy, mocking the conventions of remakes with jokes highlighting the idiocy of regurgitating ideas from the past with modern sensibilities. Characters regularly lampoon the idea of a 21 Jump Street movie with very meta dialogue. Writer Michael Bacall, Lord, and Miller take full advantage of no one wanting this remake to do whatever they want within the framework of the source material, paying it off in spades. What I love are the subtle nuances of the cookie cutter plot that allow for big comedy and action set pieces. Channing Tatum proves his comedy chops as the film's biggest surprise, offering a nice comedic turn taking on the big dumb jock stereotype while still playing into it. Tatum, the handsome but dimwitted cool kid learns how much cliques and what's cool in high school has changed and sympathizes with the geeks and high achievers. Meanwhile, Hill becomes insanely popular thanks to the more savvy teens and internet culture of today. 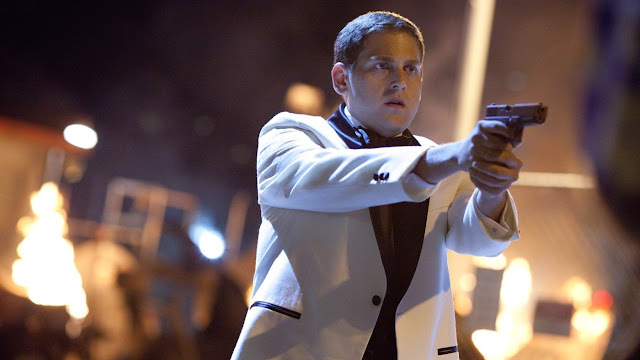 21 Jump Street features killer cameos weaving the film into timeline of the original series. Hill and company have evolved from the high school days of Superbad to revisit the same material, mixing it with buddy cop genre conventions. Hill and Tatum make for a charming on screen duo, balancing sometimes darkly comedic sensibilities with a light, fun tone. The idea of a contemporary film remake of the cheesy '80s show filmed in Vancouver done as a comedy starring Jonah Hill and directed by animators sounds awful. However, the filmmakers turned that idea on its head for an entertaining deconstruction of contemporary action comedies. 21 Jump Street is both a successful satire of the cop and teen genres while being wholly well-executed entries in them as well.